Bermuda uses 120VAC/60Hz reliable power. All outlets at Tarrafal are 3 prong (modern) grounded outlets. 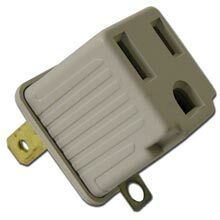 NOTE: Some other older locations on the island may use 2 prong (symmetrical) un-grounded outlets. Bring an adaptor in case you run your notebook (or something else) somewhere else. Too late? Ace Hardware in Bermuda is at Gorhams. TruValue is located here. Please bring your own logging computer, software and headphones. *Power limit in VP9 is 150W input to the finals. Please don't bring power amplifiers to the island OR RIGS WHICH WILL EXCEED THE LEGAL LIMIT (example: those that can run more than 100W output). These are not legal and I may not have power supplies that will handle these loads. If the Customs agent knows the REAL rules, your rig may be siezed. *When entering Bermuda, Amateur Radio gear is duty-free provided it will be leaving with you. However, it is very advisable to be able to produce a licence/permit if you are stopped/inspected by Customs (the Officers may not always know this). When visiting us, you will need to fill out Immigration/Customs forms, which you will receive on board ship or aircraft and need to be completed before reaching the immigration agent on entry. The physical address for operation at the VP9GE (and VP9I) location is 1 Tarafal Drive, Hamilton CR 04, Bermuda and is needed on the form(s). Don't use the mailing address at Box 1555. Maintainance of antennae, rigs and power supplies partly made by the webmaster, VP9KF.